With all the problems that we are facing in the world today, biotechnology is one of the fields that can support the society in searching for advances in diagnostics and treatments for diseases, improvements to our agricultural products and development of the environment. Biotechnology essentially is technology based on biology and chemistry. Biology is the study of life and living organisms which includes the study of genes and cells. Chemistry is the study of physical science, compositions, structures and all matters made up of atoms. Therefore, biotechnology is the process that develops products that helps to improve the lives and the health of the earth. Biotechnology is currently a booming field in Malaysia. Companies and institutions are investing a huge amount of money and effort in advancing Biotechnology in Malaysia. This has created many job opportunities for Biotechnologists. Through biotechnology, students can venture into many different fields of expertise such as pharmaceutical, environmental, agricultural and food industries. This programme is designed to produce specialised human resource equipped with the skills and know-how on new biological processes of commercial importance in a diverse range of industries such as pharmaceutical, agricultural, industrial, forensic and healthcare sectors. Students will be exposed to practical knowledge of the foundation technologies for working with DNA, proteins, cells and molecules. They will also gain knowledge and exposure to different areas of biotechnology through educational visits, professional talks, exhibitions and industrial training. Students also have to go for 7 weeks of industrial training in the industry of their choice. This field of study is as interesting and challenging as other programmed. We may not be fully aware but biotechnology has helped us live more comfortably as we have a cleaner environment, healthier body and better food production. What’s challenging is that we live on food and we will keep producing food in smaller areas of land compared to what we had before. Saving the human race is the future of biotechnology. And you can expect that what you learn and do in the future will revolve around biotechnology. 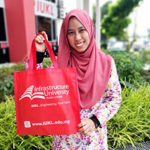 My experience in Infrastructure University Kuala Lumpur (IUKL) has been exceptional. From the students to lecturers all have supported and helped me in my journey to success. Coming from Yemen, I thought it would be difficult for me to adjust, but all I can say is I was completely wrong. I feel at home. 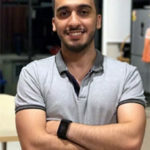 The knowledge I’ve acquired at IUKL is incredible, I have learned not only about my course but also improved in English and sports. For diploma holders, you can expect to earn around RM 1,500 to RM 2,000 as a start but note that with dedication and experience, you will earn more in years to come. But of course, your salary will also depend on the company that you work for. IUKL has received full accreditation from MQA for this programme since 2013.